Everyone has experienced the harm of gossip before. Whether the people talking didn’t mean direct harm, the result of gossip is always broken trust and hurt feelings. Gossip can be defined as information about the behavior or personal life of other people, often without the full truth revealed or known. God’s Word warns us to stay away from people who gossip and to guard our words when we speak about others! Scripture also uses the word slander which means making a false spoken statement damaging to a person’s reputation. Slander can destroy someone’s marriage, job, wealth, and family. The tongue has power and we must be careful with how we use our words. The Bible tells us what words we should speak, and which we should not. Gossip is usually the result of people not applying the biblical principles for conflict resolution; and thereby falling into a trap that brings harm to themselves and division to the Body of Messiah – hampering their and our (collective) ability to move forward in the anointing and authority of the Kingdom of God. 15 “If your brother or sister sins, go and point out their fault, just between the two of you. If they listen to you, you have won them over. God uses the differences between us to help us grow. The choice is ours on how successful our growth is. We can work through things together and grow in humility, love and unity, or we can choose to avoid conflict resolution and harbor hurts which will divide us and keep us from being all that God intends, individually and collectively. 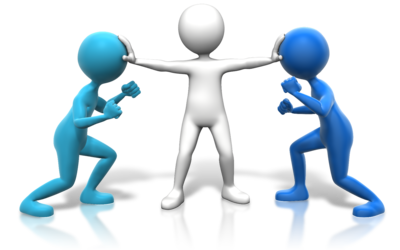 It takes discipline to make the right choices with regard to conflict resolution. It’s not easy, but it’s well worth the effort. Open and honest communication are keys to victory in personal relationships. Even when things bother you that you think aren’t a big deal, it’s important to communicate with each other in order for your relationships to remain pure and undefiled. Humble and open communication will deepen our relationships with each other so we can be more united in Christ, and more loving. We are ministers of reconciliation. The scriptures clearly state that we’re to take that position in reference to man’s relationship with God. I truly believe that we’re also to take that position to aid man’s relationship with man, as well. Godly communication, discipline, humility, reconciliation, forgiveness…these are all such big keys to the success our relationships with one another. They can have such a positive effect on our relationships and on the other side of the coin their absence can completely poison our relationships. Confrontation is often something we avoid because we don’t want conflict. But truthfully the conflict will be there whether we confront it or not. And because conflict is something that comes between two people to divide them, it breaks our unity until confronted and resolved. Conflicts need to be handled in “tool box” discussions where certain rules of communicating (tools) must be adhered to in order for people to be heard, and issues to be dealt with in a godly way. When someone communicates that something you do bothers them act in love by being sensitive to their feelings. Listen to one another with a desire to understand, and not just desire to defend yourself and respond. This isn’t always easy, but God’s Spirit (Spirit of self-control) can help you. Think the best of each other and give the benefit of the doubt in questionable situations. Approach each other without accusation. When something bothers you, communicate how it made you feel without accusation. Give the other person a chance to respond to your feelings. This is very helpful in honoring each other and reconciling problems. Ask for forgiveness when you’ve done or said something that hurt your brother or sister. Verbalize your forgiveness on the other end. There’s a tremendous amount of healing power within words of forgiveness. They truly are words of life. Seek to build one another up instead of tearing down. Our tongues are so powerful. Guarding them is essential. Think before you speak and listen to the words that come out of your mouth. Repent if you hear yourself tearing others down with your tongue. In humility look to yourself as the source of conflicts first. Be open to God showing you things He wants you to repent of. Prayerfully seek the Lord when something negative is pointed out about you. This isn’t easy, but it’s essential for the growth of our character. Each of us, as humans, has wounds that we may not know about, or realize. These are often the reason conflicts arise in the first place. We must rely on God and each another, to aid in our individual healing processes. Desire recovery and growth. Be intentional about your healing. Seek the Lord for healing and don’t just “stuff” things inside of yourself. Seek to identify things that come between us and to recognize them for what they are. We can’t change each other, but the Holy Spirit can. Because of that, pray that the Holy Spirit works in all your conflicts. Don’t get emotional, defensive or manipulative in conflict; but open your ears and hearts and listen to each other objectively in the midst of the conflict. This allows for reconciliation in conflicts and the restoration of unity, which are of utmost importance in the body of Messiah. Sometimes there are wounds that are inflicted upon us by what people do or say that trigger things from our past. It’s important to really get to know ourselves and each other, being sensitive to the hidden psychology of our personalities. It’s a natural thing to want to avoid confrontation at any cost. It does you and the person you’re in conflict with a great disservice by not opening up and talking about adverse things that were said or done. By not confronting we aren’t really loving our brothers and sisters the way that God wants us to. There’s a side to love within the Body of Christ that calls us to desire to see our brothers and sisters grow more into the likeness of Christ. Quite often it takes confrontation to address some issues. Godly confrontation is a big part of our responsibility in our relationships with one another.